Published: July 20, 2011 at 07:42 p.m. I can watch the moon landing on my TV, but still can't get NFL Network. Here are some other gripes. One of my favorite comedy bits of all-time comes from Brian Regan who talks about how putting a man on the moon is the worst thing to ever happen to society-- because no matter what goes wrong, the fact that we have put a man on the moon makes our lives worse. Or so we believe. 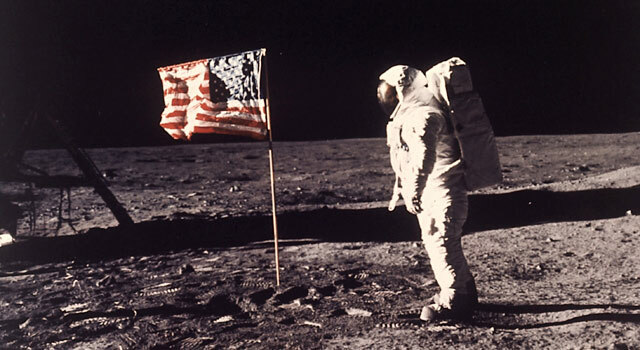 Well, with the anniversary of the moon landing today on July 20 (the real anniversary, not this one from Lloyd Christmas), here are six grievances about the NFL that are exasperated because we put a man on the moon! Of course, this is all assuming that you believe in the moon landing. 6. ... Have a replay system that works. Honestly, how many times have you sat at Buffalo Wild Wings (or your preferred viewing station for football and other appropriate actions) and seen a player clearly drop a ball, despite it being ruled a catch? It usually takes the room five seconds to determine it was a drop, but what happens? The coach challenges the call, the official spends about six minutes under the hood and then returns to says that it's inconclusive -- the play stands. Which makes the replay challenge a bigger waste of time than reading one of my columns. Oh, and the good news â¦ the replays should take longer this year. Wonderful! 5. ... Have a decent developmental league. NFL Europe carries an unfair stigma with it because of the gaudy uniforms and the fact that nobody in the United States watched it. But that's unfair because NFL Europe (and it's many variations) played a part in developing players such as Kurt Warner, Dante Hall and Jake Delhomme. Look at the stuff the NFL took from the XFL -- overhead camera and Tommy Maddox -- and you can't tell me that a decent league isn't worthwhile. And if you put together a decent developmental league, we get closer to relegating the Bengals. 4. ... Find someone better than Joe Buck. Justin Timberlake spoke for all of us when he mocked Buck during a drunken interview during the All-Star Game. (To clarify, it was Timberlake who was drinking â¦ that we know of.) Buck calls an NFL game as if he is sulking because his wife took him to the movies to watch The Notebook. And what's the deal with that stupid robot? Again, that would have been O.K. in the pre-Moon landing America. 3. ... Make Super Bowl weekend a three-day holiday. Does anybody do any work on the day after Super Bowl Sunday? I mean, other than the hardworking folks of NFL.com, of course. Either make this an actual holiday, or push the start of the season back so that the Super Bowl happens on President's Day weekend, which I imagine the league is going to eventually try anyway. This has gone on long enough. Southern California has proven that it can survive without NFL football. But the NFL needs to be back in Los Angeles. We won. But when you do it, do it correctly. No more owners like Georgia Frontiere or Al Davis. In fact, just sell the Rams to AEG and let's move on. 1. ... Settle this lockout. Seriously, what the (expletive) is taking so long? Got another example? You can send more suggestions via Twitter or via Facebook . And be sure to catch the latest on the Dave Dameshek Football Program. "Pick Six: Worst NFL splits..."